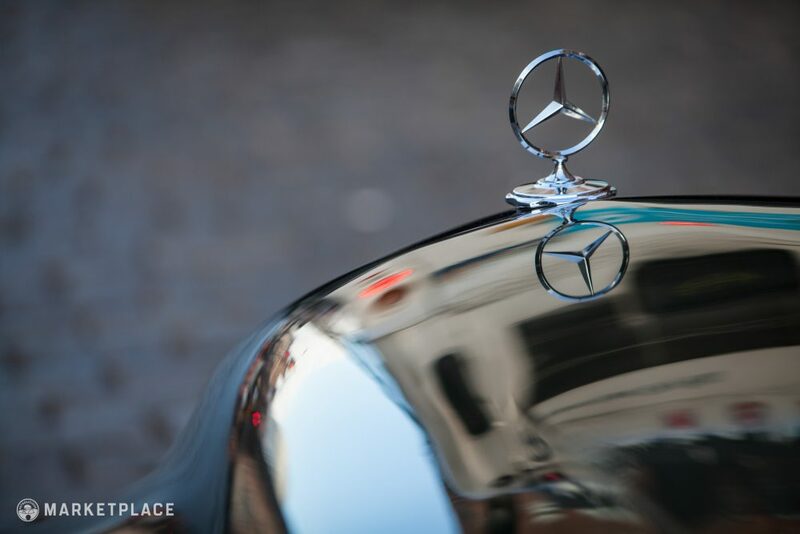 After Mercedes Benz’s great success with the post-war “Ponton” sedan, coupe, and convertible models, the successor’s lineup had big shoes to fill. 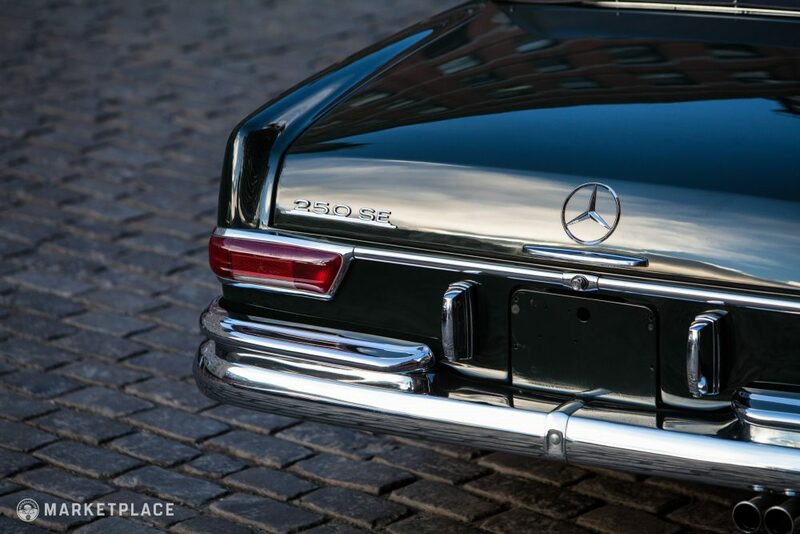 The luxury marque’s response was the W111 chassis, which initially debuted as the iconic Heckflosse (meaning “Fintail”) sedan at the 1959 Frankfurt Auto Show. Based on the Ponton’s blueprint, the W111/W112 track was widened, the greenhouse was enlarged for increased visibility, and the overall shape was boxier with a more upright front and rear design. 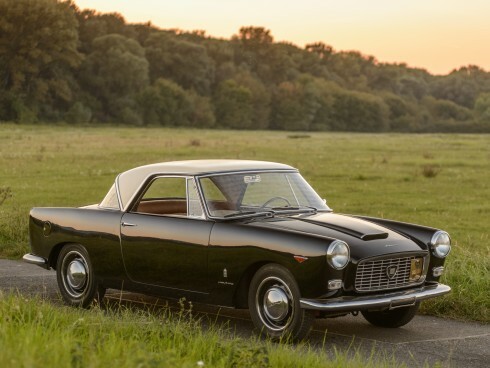 The new chassis focused heavily on safety, featuring front and rear crumple zones and retracting seat belts, both of which were quite advanced for 1959. 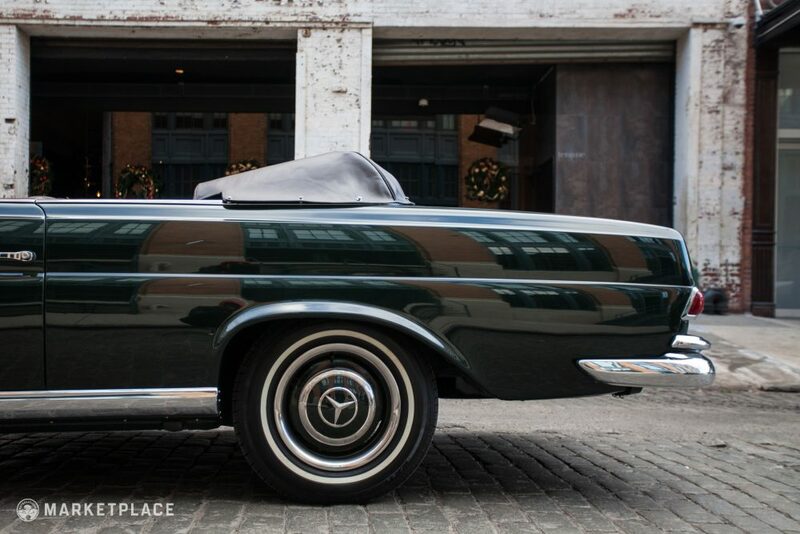 By 1960, the sedan-based coupe was added to the lineup, with a two-door cabriolet version following shortly after—both the fixed roof and drop-top were designated as 220SE. 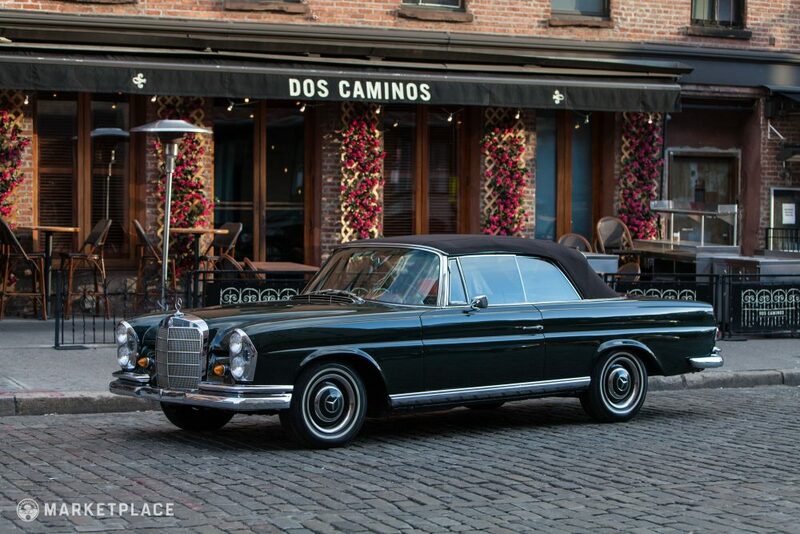 By 1965, the 220SE was replaced with the 250SE, which gained Mercedes’ latest M129 2500cc straight-six engine. The new 150-horsepower engine dramatically increased performance. 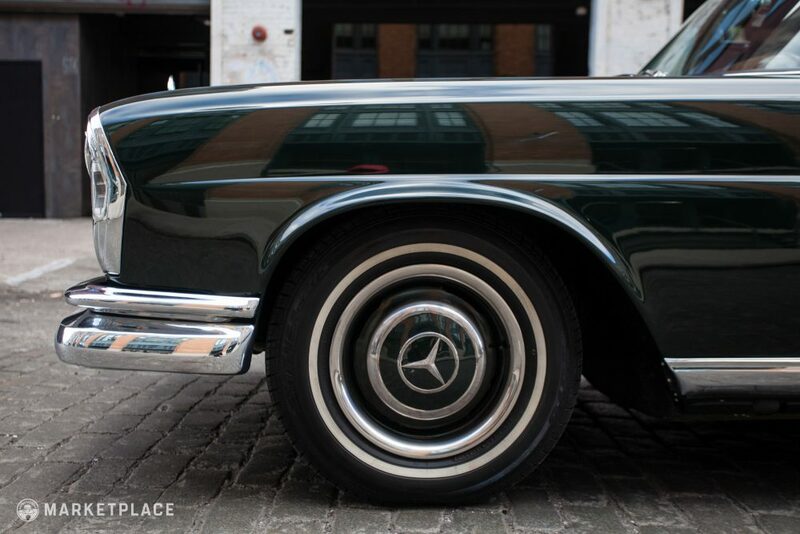 The sedan, coupe, and cabriolet proved to be another lineup design score with great sales success for Mercedes-Benz; production lasted from 1959 to 1971, with more than 370,000 units produced. The coupe and convertible variants’ rear end was heavily revised with less dramatic quarter panel fins—a design that was phased out by the end of the decade. 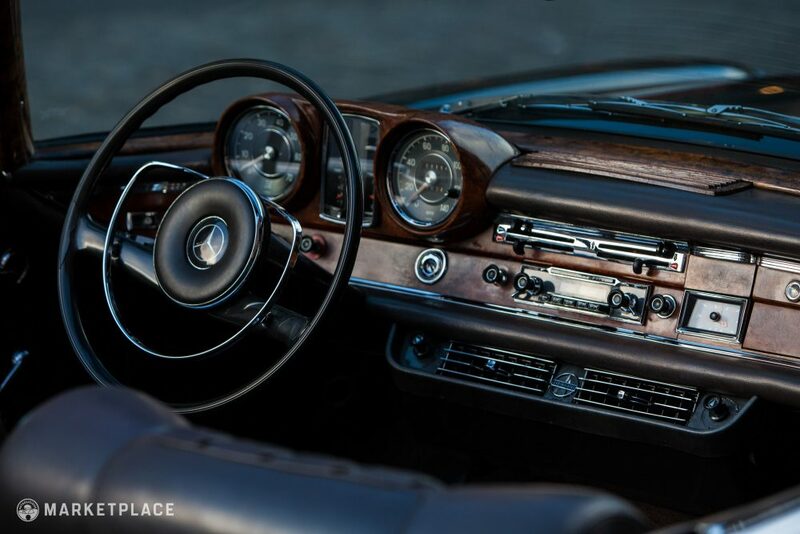 Both the coupe and cabriolet focused on luxury with a lush leather cabin, woodwork, an abundant supply of highly polished metal trim, and optional amenities such as an automatic transmission, power steering, air-conditioning, and a sunroof for the coupe. 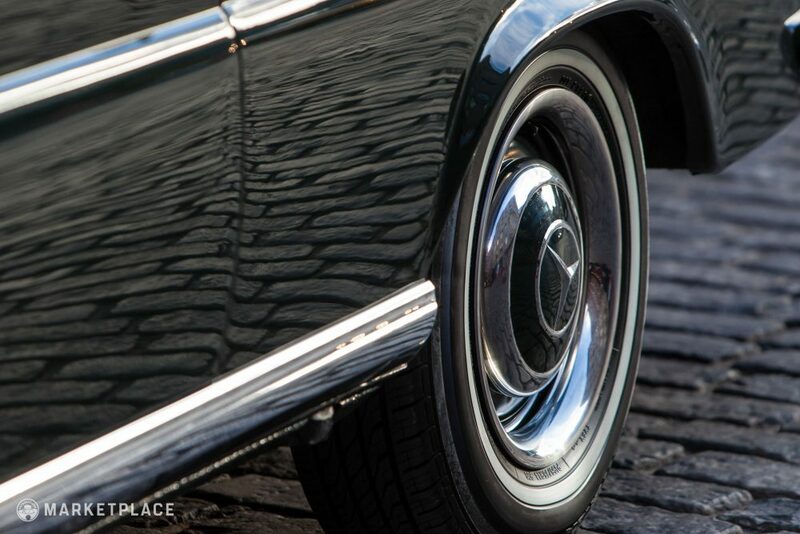 The 250SE model received new 14-inch wheels with chrome beauty rings and new body-color-matched center caps. 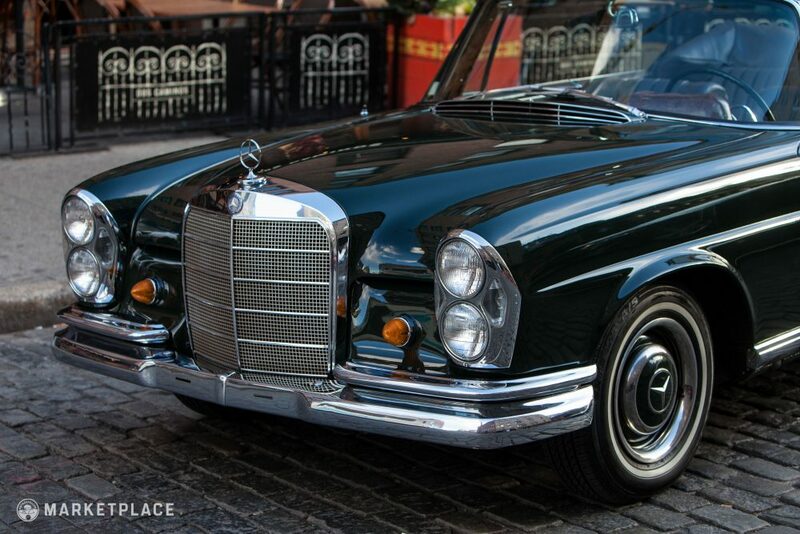 The 250SE model was only produced from 1965 to 1967 with only 954 cabriolet models produced, making it the rarest of the W111 models by a significant number. 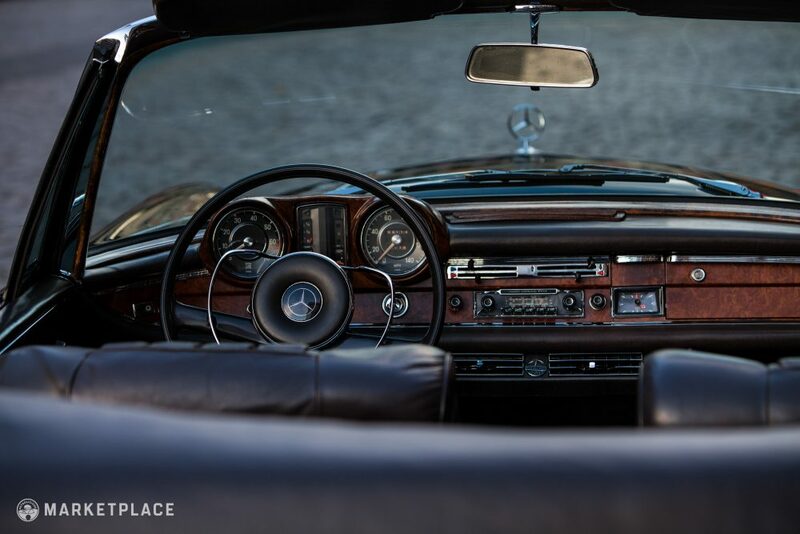 The convertible was also the most expensive W108/W109 model, making it a staple of luxury and exclusivity for even the wealthy elite. 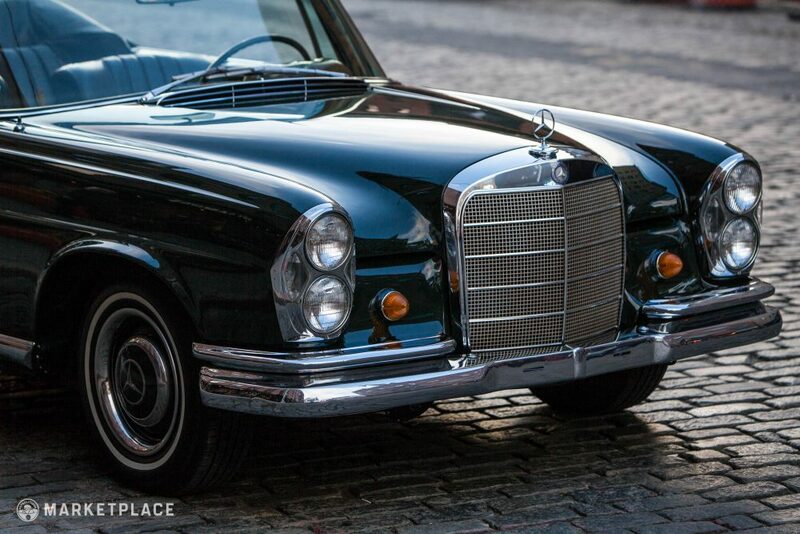 Stately, handsome, plush, and rare, the 250SE is a solid entry in the long line of Mercedes-Benz masterworks. A Mr. James P. Highsmith purchased this car new from RBM of Atlanta, Georgia. First registered on June 29, 1967, Mr. Highsmith regularly drove and maintained the automobile for its first 40,000 miles. 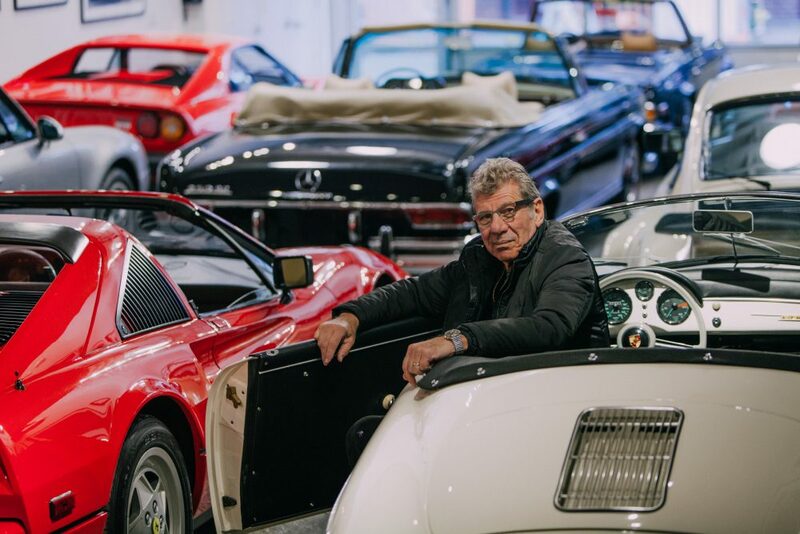 In the spring of 1971, the car was acquired by Mr. Euli Dominy Jr., who owned the car briefly until passing it along to its third owner, Mr. Ernie Gaspard, in 1972. 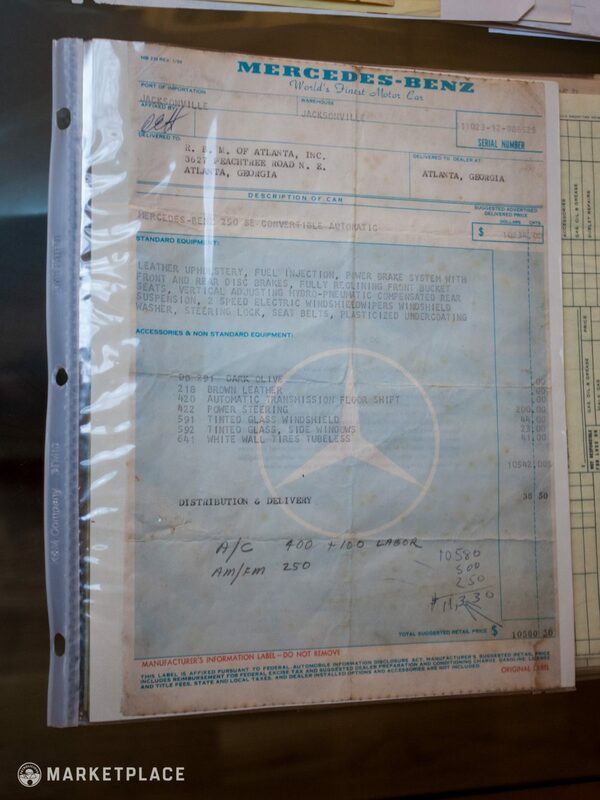 Mr. Gaspard was an interior designer hired by Mr. Dominy and the Mercedes was used as payment to fulfill a work contract between them. 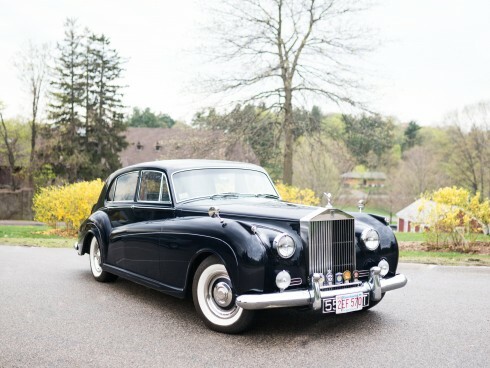 Mr. Gaspard rarely drove it, as the car was sitting in storage until the mid-1980s, at which time it was given a thorough and well-deserved servicing along with a new paint job and top. 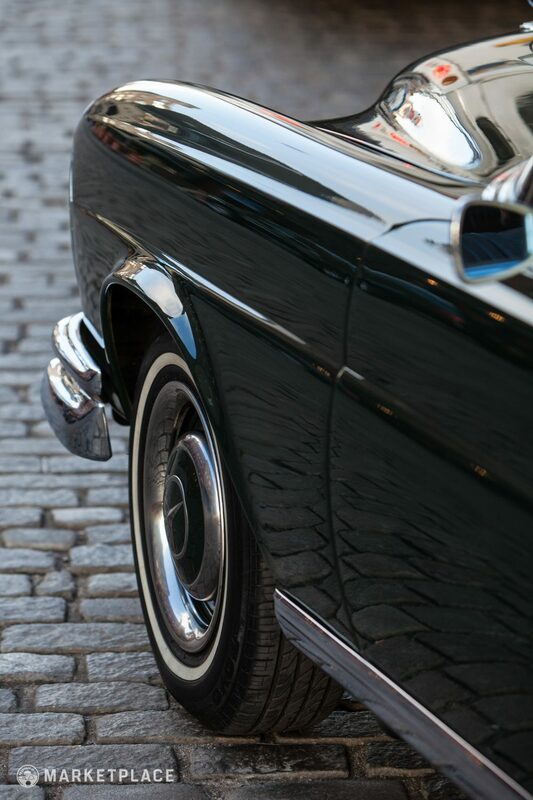 After the car’s refresh, Mr. Gaspard enjoyed his 250SE until his death in 2010, when his nephew inherited the vehicle. 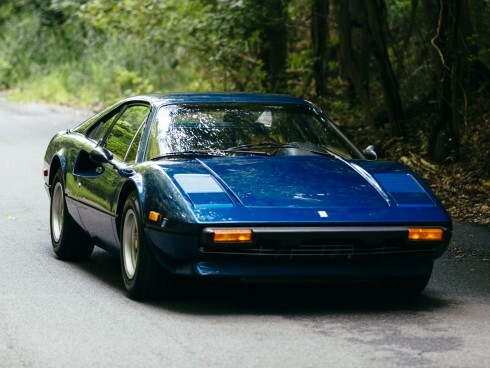 After more than 40 years under the care of the Gaspard family, the car is now being offered for sale. 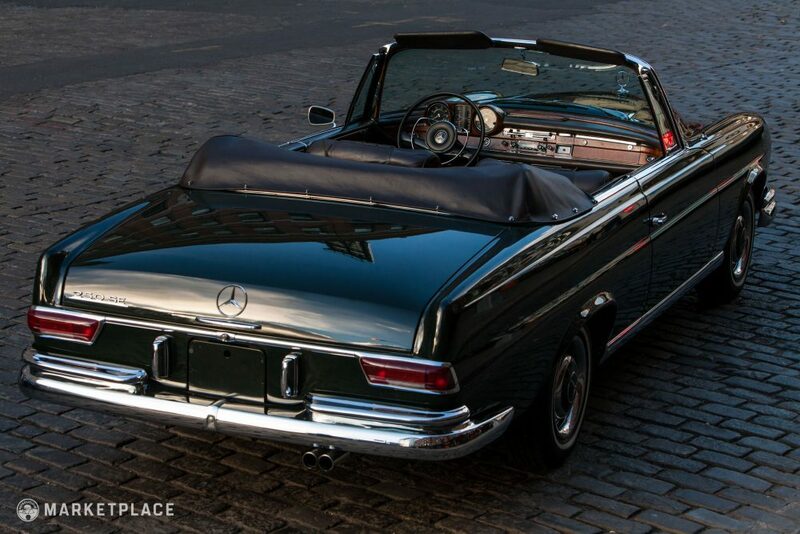 This final year 1967 Mercedes-Benz 250SE Cabriolet has been meticulously and professionally maintained since new; service record documents date all the way back to 1967. This car has been lovingly cared for by all three of its previous owners and represents the lasting quality of a solid German automobile when properly kept. 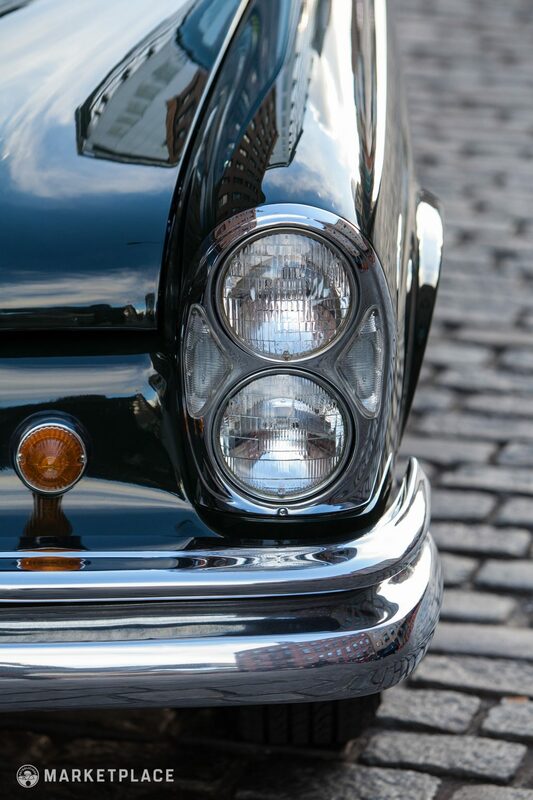 The car was professionally repainted once in its nonmetallic Dark Olive paint. The interior is entirely original, the body panels and chassis are free of corrosion, and the car has never been involved in an accident. 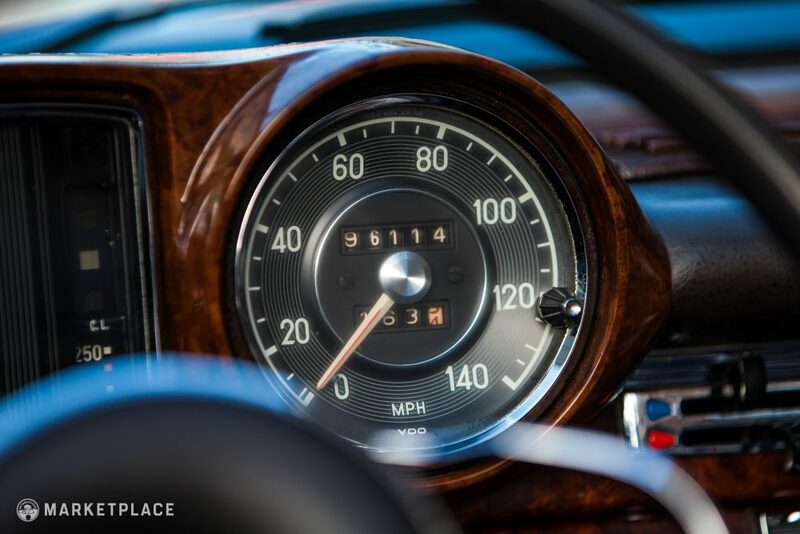 Complete, unmodified from stock, and religiously serviced, the car appears fresh despite its 96,110 mile odometer tally. Body – All body panels are original to the car with even panel gaps throughout. 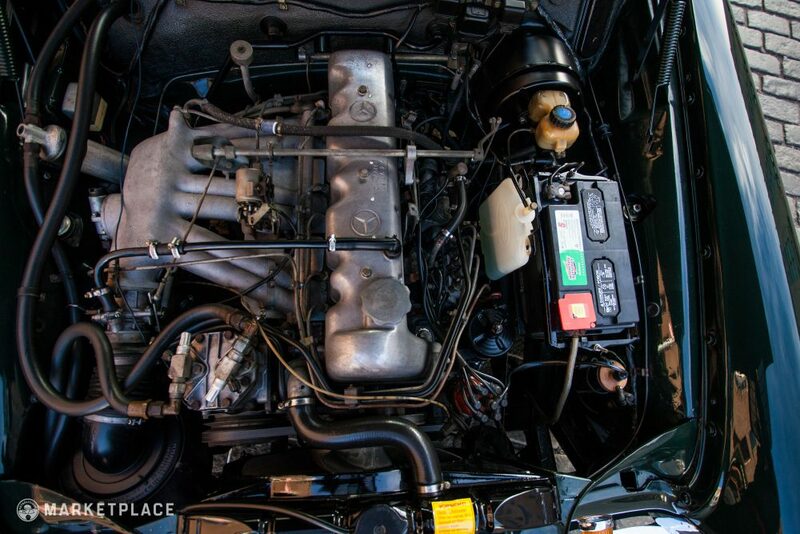 The car has never been involved in an accident and is free of any rust, corrosion, dents, or major imperfections. 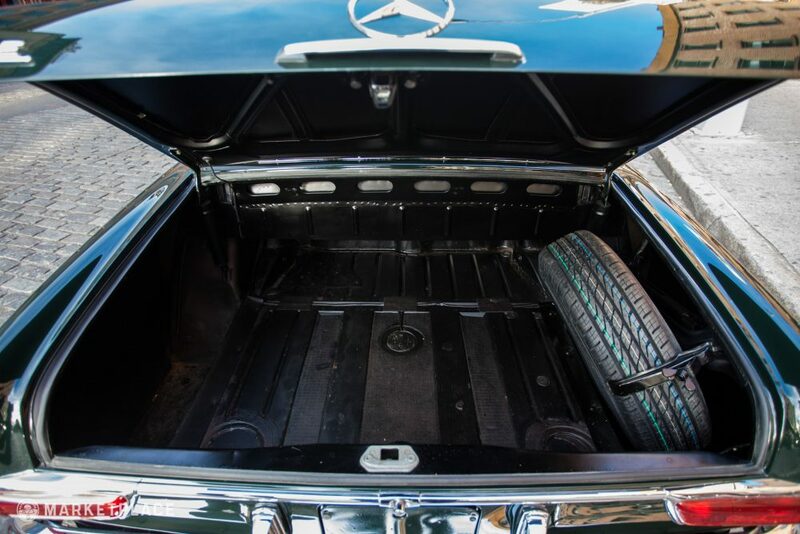 The floor panels are original and in outstanding condition with original Mercedes-Benz undercoating. Paint – The car left the factory in Dark Olive and was professionally repainted once in the 1980s during the ownership of Mr. Gaspard. The paint remains in exceptional condition with excellent shine that complements the stately shape beautifully, offering more warmth and depth than outright black. Trim and Glass – All of the brightwork, including the front and rear slab bumpers, are original with a highly polished finish, free of any marring or pitting. Wheels – The factory 14-inch steel wheels wear their appropriate chrome beauty rings and body-color-matched center caps with the correct thin-line whitewall tires. Convertible Top – The convertible top was replaced with an OE-style custom unit installed in the mid-1980s. The top fits like factory and is free of stains, tears, or sun damage. 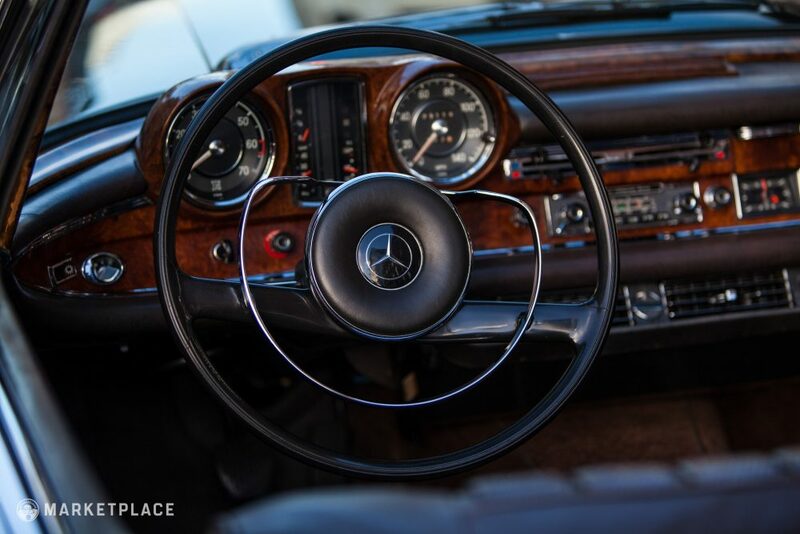 Steering Wheel – The large two-spoke helm is a stunning example of vintage steering wheel jewelry, with a leather center pad and elegant chrome horn ring. The wheel’s components and material show minimal wear. 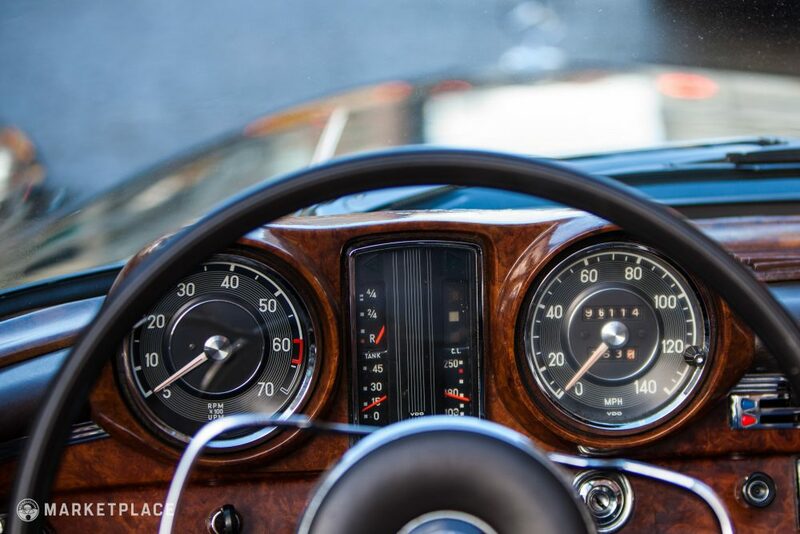 Dashboard & Instrumentation – The malty, dark stained upper dash wood trim, instrument panel, insert, and center console stow are in good shape with an even shine and no cracking. 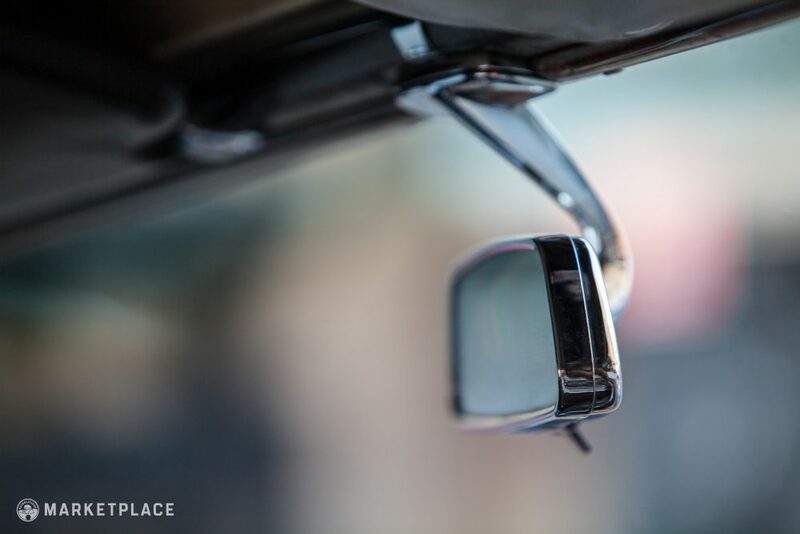 All VDO instruments are original to the car and fully functional. 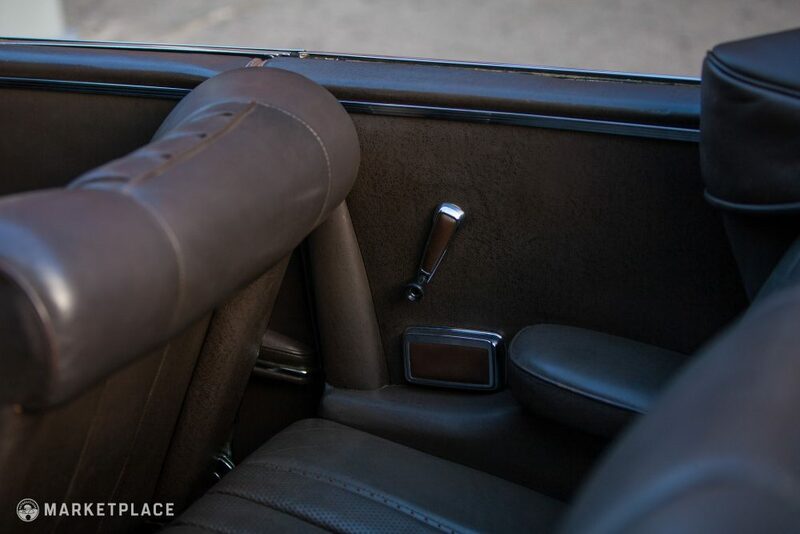 Seats, Trim, & Carpet – The all-original brown leather cabin is inviting with light wear shown on the front seats. 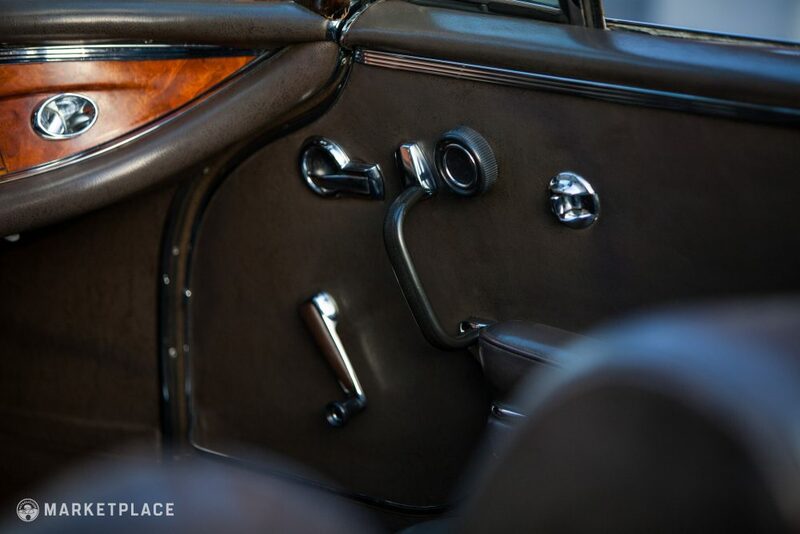 The door panels, dash leather, and wool carpeting are also original and in exceptional condition given their age. 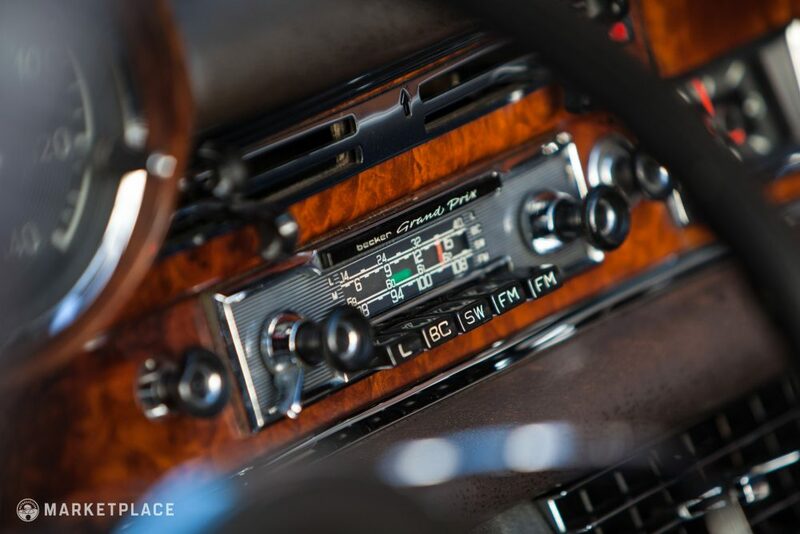 The switchgear, Becker Grand Prix AM/FM radio, and accessories all work properly. 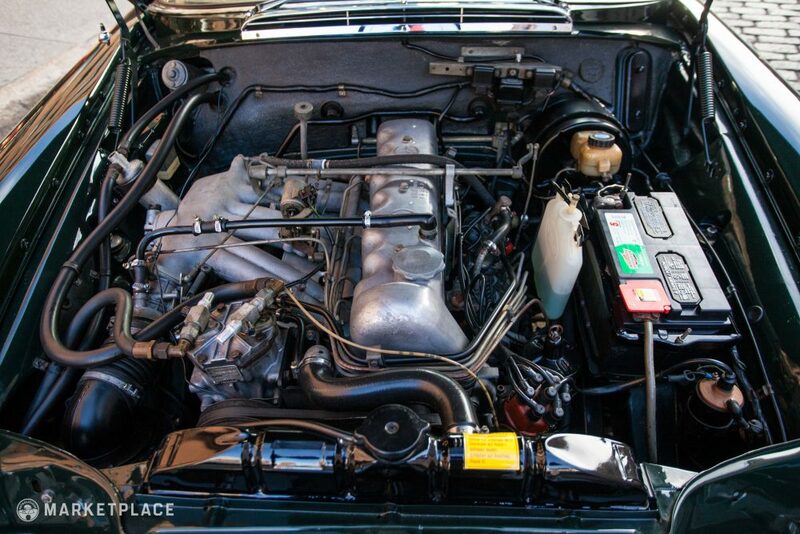 Engine – The original 2.5-liter M129 straight-six engine has never been opened and runs like a Swiss watch. The Drive: The engine starts from cold effortlessly, purrs quietly and smoothly, and climbs through the rev range with good, even torque delivery. 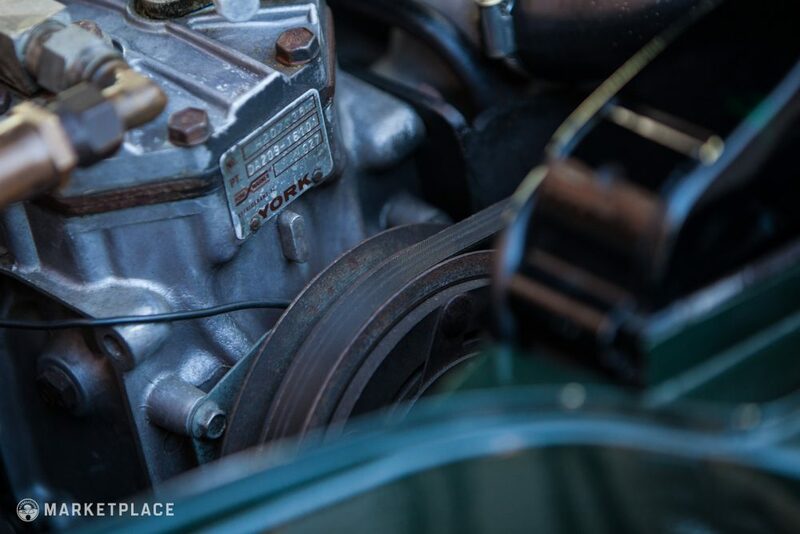 Transmission – The original four-speed automatic is still in place and is unrestored. 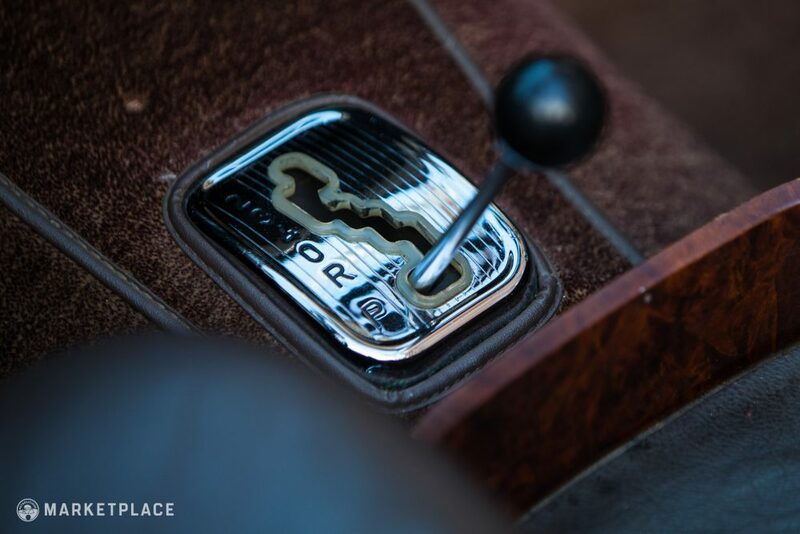 The Drive: The factory-optioned four-speed automatic is controlled via a delicate floor-mounted stick. 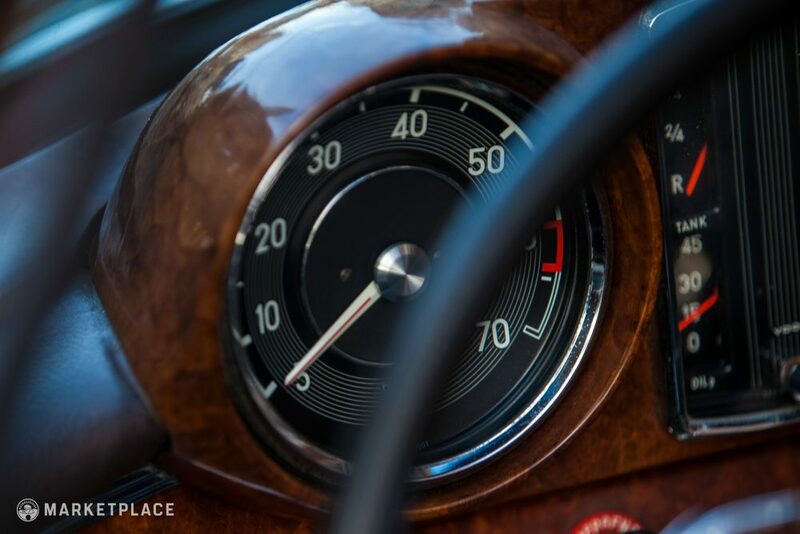 The car engages gears with ease and shifts surprisingly smoothly. There are no odd noises or shifting issues to note. Handling – The car rides on its original double wishbone suspension consisting of coil springs and shocks with a torsion bar stabilizer front setup. The Drive: The suspension is very supple, even when loaded with three passengers and a driver. The car stops quickly given its near 3,200 lb curb weight thanks to dual hydraulic circuit servo-assisted four-wheel disc brakes. 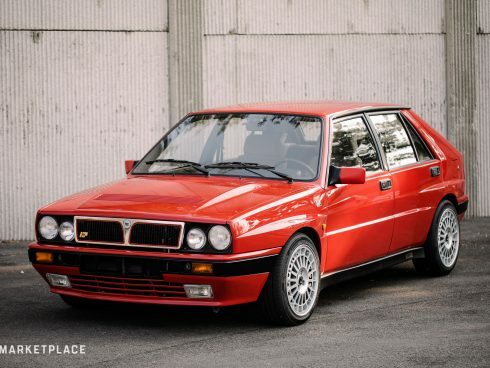 Aside from one respray back to its factory Dark Olive paint and a replaced canvas roof, this car remains completely original. 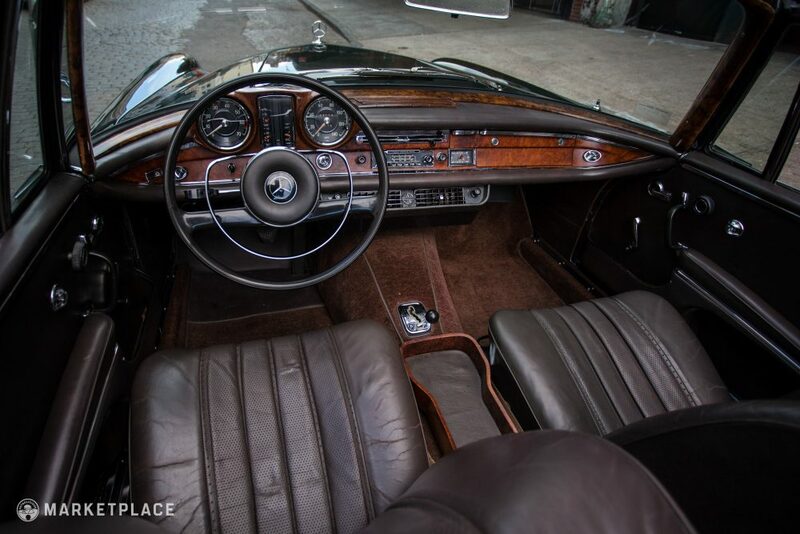 The interior is remarkably clean given its age—a testament to the great care this example has received since new. The engine and transmission haven’t been rebuilt but show good cylinder compression and smooth shifting respectively. 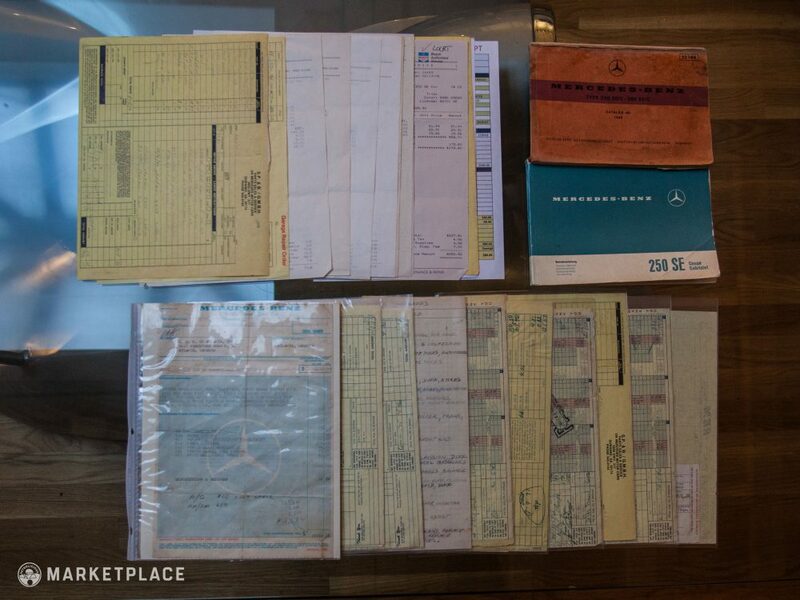 Included in the sale is the original window sticker, owner’s manual, build sheet, spare tire, toolkit, and maintenance records. 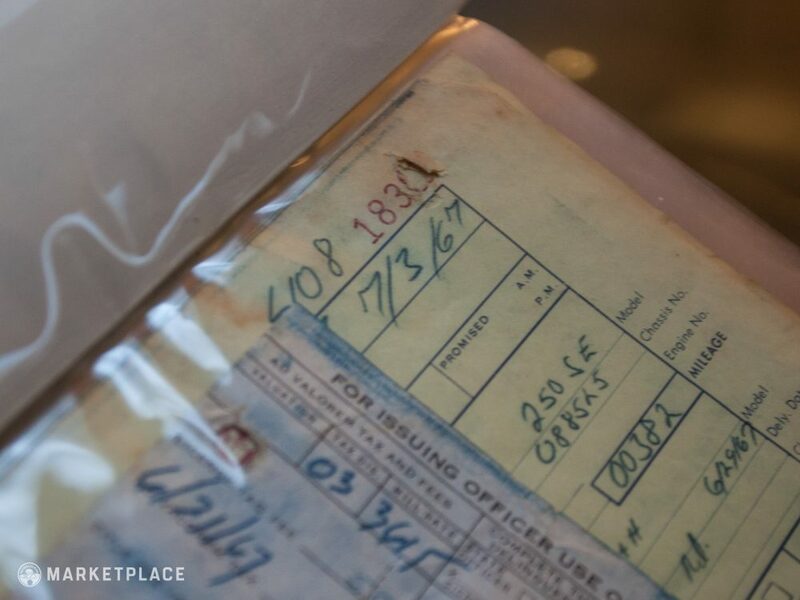 A comprehensive booklet of all service conducted since new is documented, including the initial application for registration in 1967. 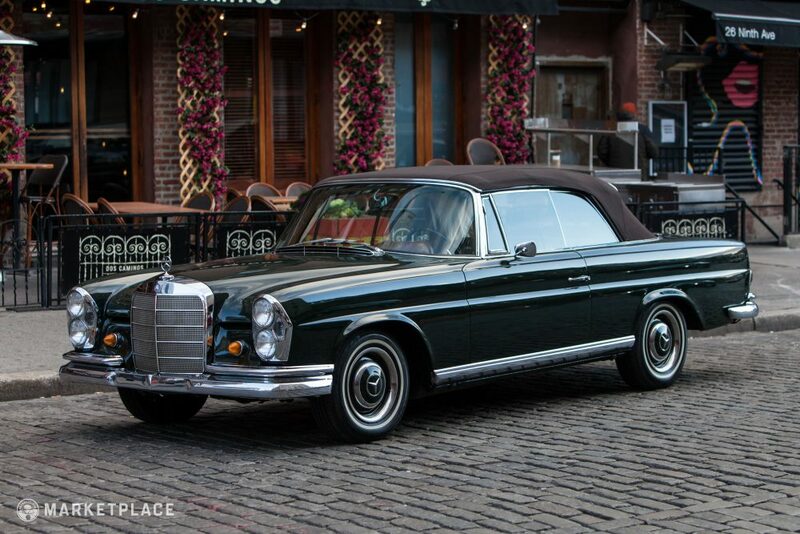 On the market currently there are several other restored 250SE Cabriolets in excess of $100,000. 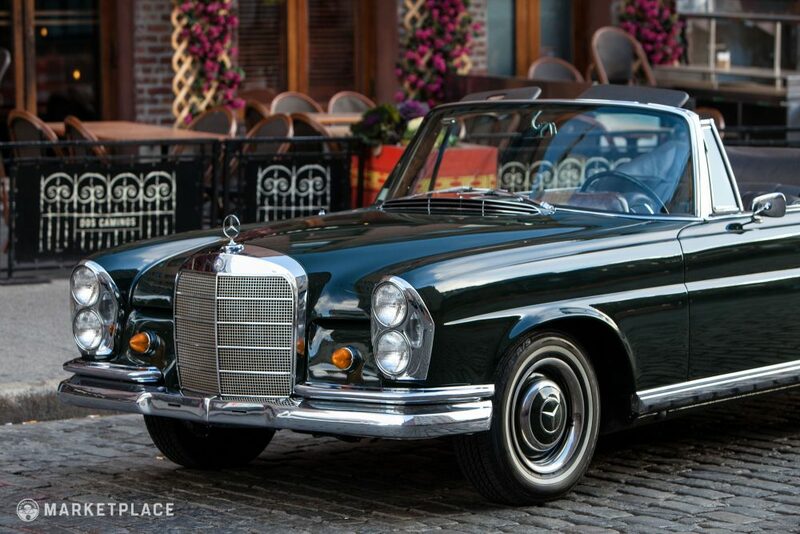 Rare Model – The Cabriolet was the most expensive 250SE model, which is likely the reason for its low production figure of just 954. 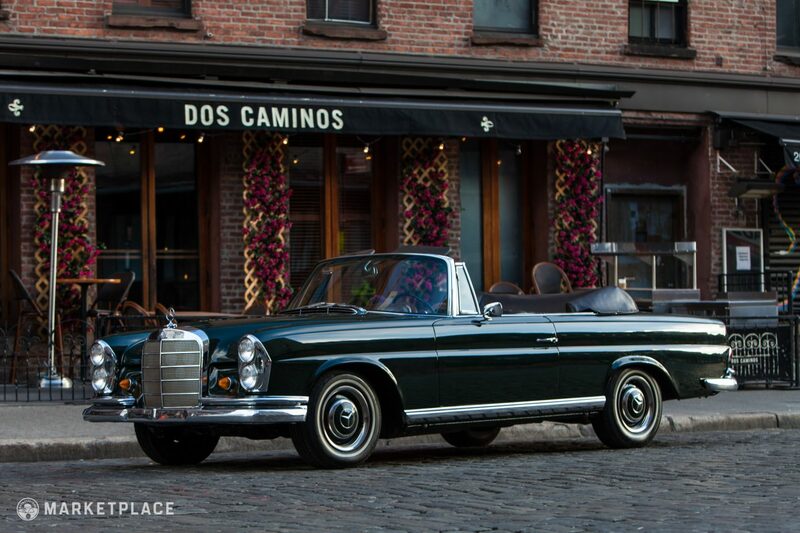 It’s a beautifully proportioned convertible from Mercedes’ golden era that oozes design restraint, luxury, and class. 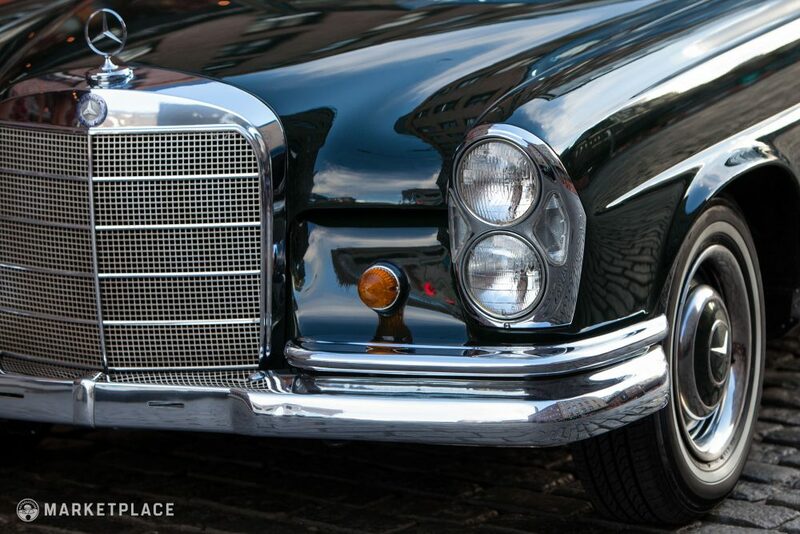 Great Colors – It seems the majority of Mercedes from this period are available on today’s market in either white, silver, or black. This Dark Olive over brown leather example is a standout combination that complements the car’s stately lines. 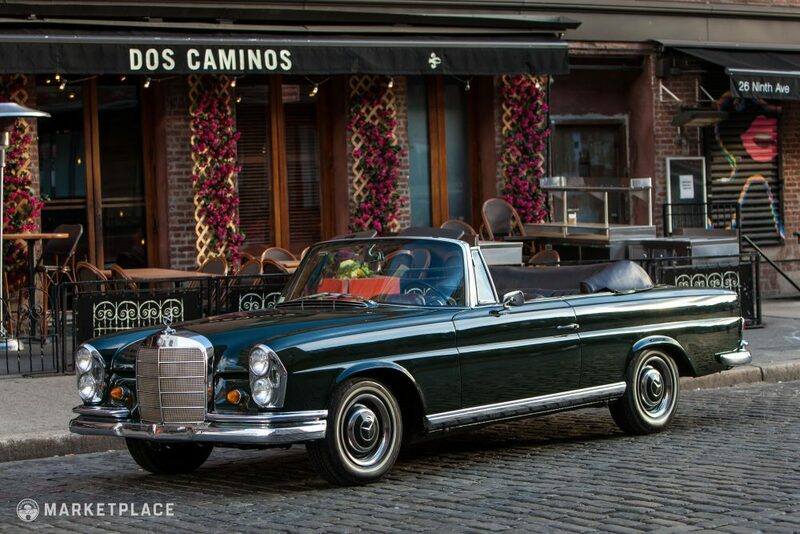 This car is for sale by Elliot Cuker of Cooper Classics in New York City. 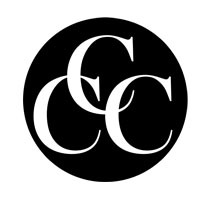 You can get to know him better here. 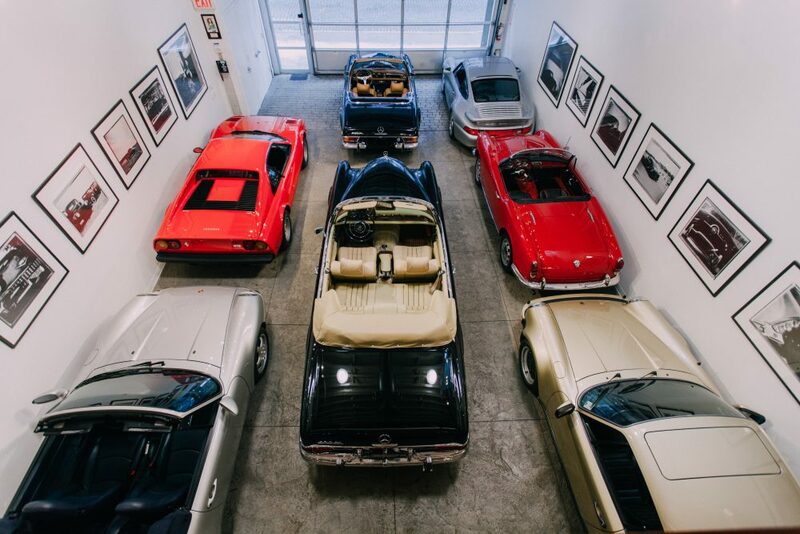 Want to list your car on Petrolicious?